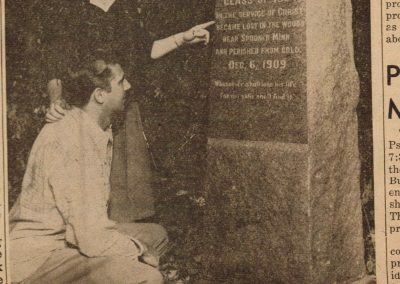 Upon ordination in 1909 from the United Church Seminary (later Luther Seminary) in St. Paul, Minnesota, Fugleskjel accepted twelve preaching posts in the remote Rainy River district in northern Minnesota and Canada. His work required him to travel long distances through uninhabited swamps and forests. 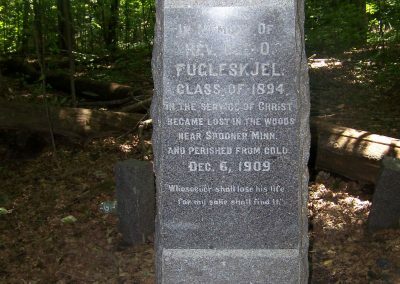 On Sunday, December 5, 1909, Fugleskjel held communion services at the Halverson home in Silver Creek, Minnesota. His loud and dramatic sermons were in Norwegian. They sometimes frightened younger members in the congregation. 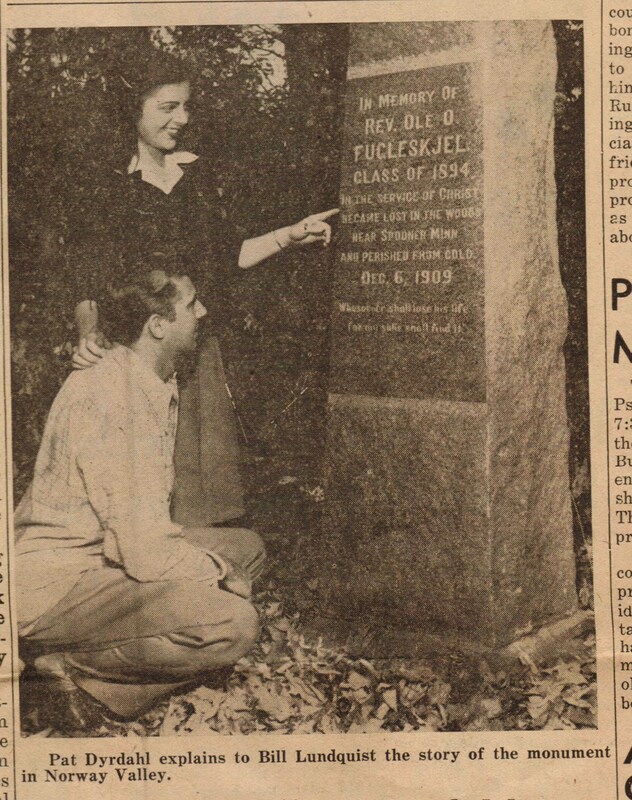 At 2 p.m., Fugleskjel departed for a 3:30 p.m. engagement at a lumberjack camp located near Clementson, two and a half miles away. A snowstorm raged and friends begged him not to leave. Determined, the 41-year-old lightly clad Fugleskjel departed. When he did not arrive at the logging camp, it was taken for granted that the weather had deterred Fugleskjel from his journey. Some distance from the Halverson home the trail divided, one fork leading south and the other east. Fugleskjel had been over the route once before. By mistake he took the south trail and apparently did not discover his mistake until he was hopelessly lost in the woods at the end of the road. His trails showed that he had wandered aimlessly many miles in the woods, frequently crossing and re-crossing his own tracks. At times he stepped through the snow into the mud and sank waist-deep in icy water. Sunday night, the temperature dropped and he must have suffered terribly; large balls of snow and ice were found frozen to his shoes. Monday morning, Fugleskjel was thought to have found his bearings, for the last part of the trail led due north for three quarters of a mile. His steps were very short; he could proceed no farther. But by exercise he endeavored to keep alive still a little longer in hope that relief might arrive. Within a radius of fifteen feet the snow was found tramped in an almost icy surface. At last, presumably Monday evening, his strength failed him. Falling to the ground, and upon his back, with hands across his breast—as if in attempt to fold them in a final prayer—he died. Students at the seminary, deeply moved by his death, believed that the memory of such faithfulness deserved to be perpetuated. 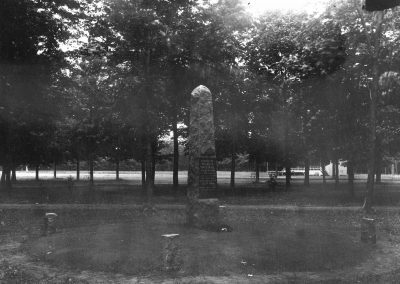 It was proposed and carried forth that a monument or bautastein with proper inscription be erected at St. Olaf College. Fugleskjel Memorial Host to Norway Valley Visitors. 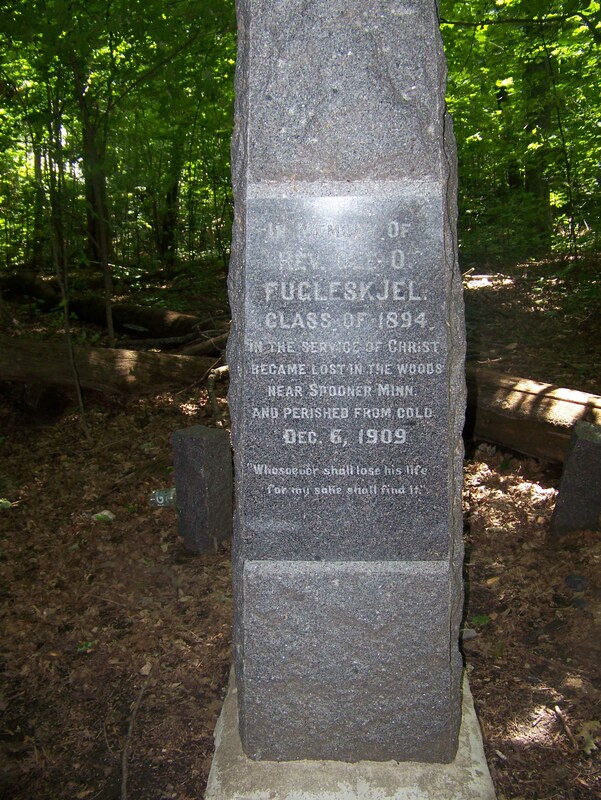 Monument to Ole O. Fugleskjel, Class of 1894. 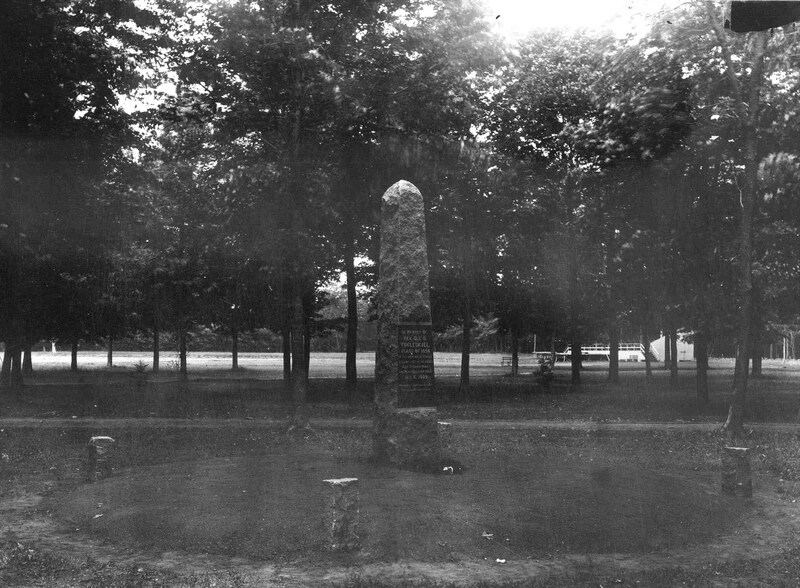 Formally on main part of campus, later removed to Norway Valley. 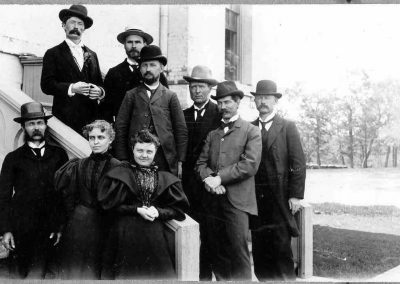 Faculty of St. Olaf College (on steps of Old Main, 1895-1896). 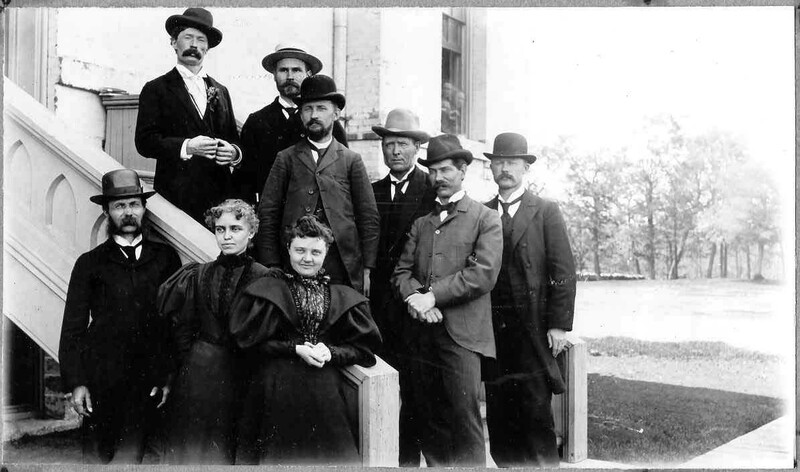 Ole O. Fugleskjel, A. Fossum, Olav Lee, President Thorbjorn N. Mohn, Carl J. Rollefson, Halvor T. Ytterboe, Ole G. Felland, Marie Krohn Rollefson, Mathilde Finseth Roseland. Close-Up: Ole O. Fugleskjel Monument. 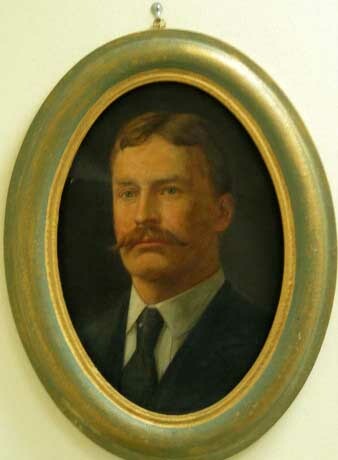 Portrait of Ole O. Fugleskjel, ca. 1910. Creator: Herbjorn Gausta, Painter (Presumably painted after Fugleskjel’s death).